Ian and Margaret Cartwright now keep a supply of bags stored in their car to make sure they don’t forget. Shoppers have gone BYO rather than pay for plastic bags at supermarkets. 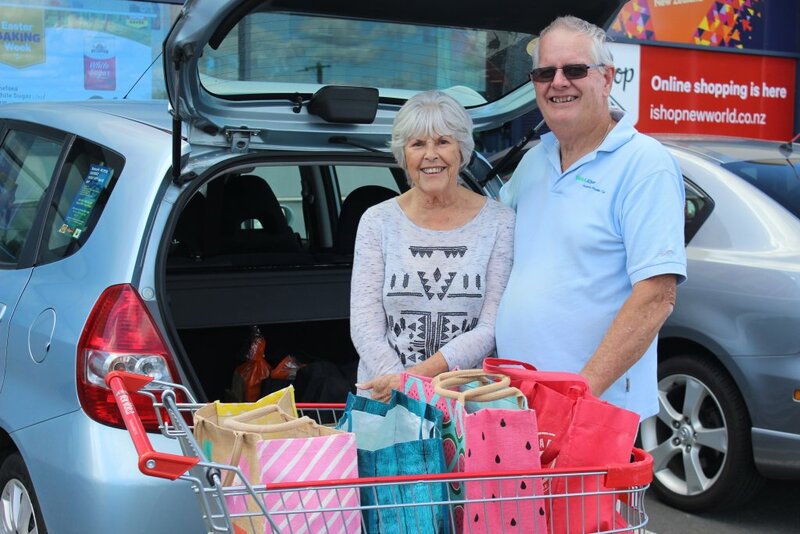 Just a few months after supermarkets stopped handing out bags – and left shoppers with the option of bringing their own or paying for them – couples like Margaret and Ian Cartwright of Cambridge have it well sorted. “We’ve got quite the collection,” said Margaret, at the end of a shop at New World, Cambridge. “We take our bags everywhere. Ahead of the change a survey showed more than nine out of 10 shoppers supported removing the free plastic bags, which were usually recycled once as a kitchen rubbish bag before being consigned to a land fill. New Zealand shoppers were using millions of them a year, and each would take about a century to breakdown. Ian and Margaret Cartwright now keep a supply of bags stored in their car to make sure they don’t forget, and most of the time it works. “Except for the other day when we came in a different car and had no bags,” Ian sighed. The phase-out is part of the government’s new legislation on plastic shopping bags announced in December last year – the Waste Minimisation (Plastic Shopping Bags) Regulations 2018 – which will see single use plastic carry bags removed from shops within the next three months. From July 1 it will be illegal for retail stores to sell or provide plastic bags for the purpose of carrying or distributing their sold goods. This applies to plastic bags which have carry handles, are new or unused, and are made of any type of plastic less than 70 microns in thickness – including biodegradable plastics. It also includes the heavier boutique-style shopping bags that some retail stores initially introduced as reusable alternatives. New World stores have stopped supplying the reusable plastic bags, now offering paper bags, reusable fabric bags and chiller bags. “A lot has been happening in the background,” said Logan McKenzie, owner/operator of New World Cambridge, explaining the logistics of the phase-out. Across Foodstuffs supermarkets nationwide, 350 million single-use plastic bags will no longer be distributed each year. “Waste diversion is critical to a sustainable community, and as a cornerstone of this community,” said McKenzie, whose store stopped providing single use plastic bags on January 1, along with the rest of the country’s Foodstuffs supermarkets. Foodstuffs NZ Head of External Relations Antoinette Laird said the organisation was investing in “so many initiatives to reduce or eliminate unnecessary packaging”, encouraging BYO containers for meat and seafood departments, and working with suppliers to help them reformat their packaging. At the Cambridge New World, other aspects of plastic packaging are being looked at too, like swapping non-compostable lines of glad wrap for alternative solutions. The store is quite mindful of recycling too, diverting over 90 percent of our store waste away from landfills. 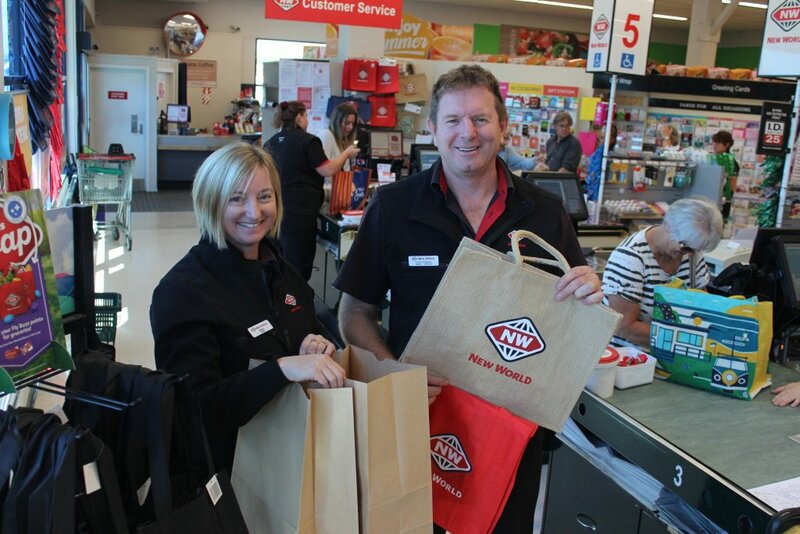 New World Cambridge owner/operators Logan and Nicola McKenzie love to see customers bringing in their reusable bags. The store has been part of a nation-wide effort to stop 350 million single-use plastic bags being distributed this year. Countdown was the first supermarket brand to phase out single use plastic carrier bags last year on October 15, two and a half months ahead of schedule. A Countdown spokesperson said the organisation would be ready to meet the new government legislation by July. “We know our customers are keen for us to phase out the barrier bags in a number of areas in our stores and it’s something we’re definitely looking at. Our challenge is finding convenient options that work for stores and won’t have a big cost impact for customers. Rest assured not all forms of plastic are being eliminated from New Zealand retail stores, just the unnecessary ones. Foods like raw fish from the seafood department or shaved ham from the deli will still be sold in the usual smaller plastic bags at the supermarket. Pet owners can still buy rolls of plastic bags to pick up after their pooch, and rubbish bags will still be sold as normal. Plastic bags without handles will not be affected. Plastic bags that form an integral part of a product’s packaging, such as sealed pouches with handles, will also still be allowed. Shops around Cambridge are changing their ways as the July 1 deadline fast approaches. Wholly Cow butchery has already swapped plastic carry bags for paper bags. It still uses plastic packaging where necessary, and is considering other options to reduce plastic use. Vege Fresh is now charging 15 cents for plastic carry bags – ordering in a biodegradable option made from corn – and offers a reusable plastic-free produce bag made by Boomerang Bags in Cambridge. Over the Moon Deli has always supplied paper carry bags only, and has signage encouraging customers to bring in their own reusable containers. Cheeses are also available in a plastic-free wrap. Shops will have had six months to use up existing stock when regulations take effect on July 1, a move which some retailers believe is not enough time. Full details on the phase out are available at the Ministry for the Environment’s website.